Thanksgiving is past and we move on toward Christmas and then the end of the year 2009. 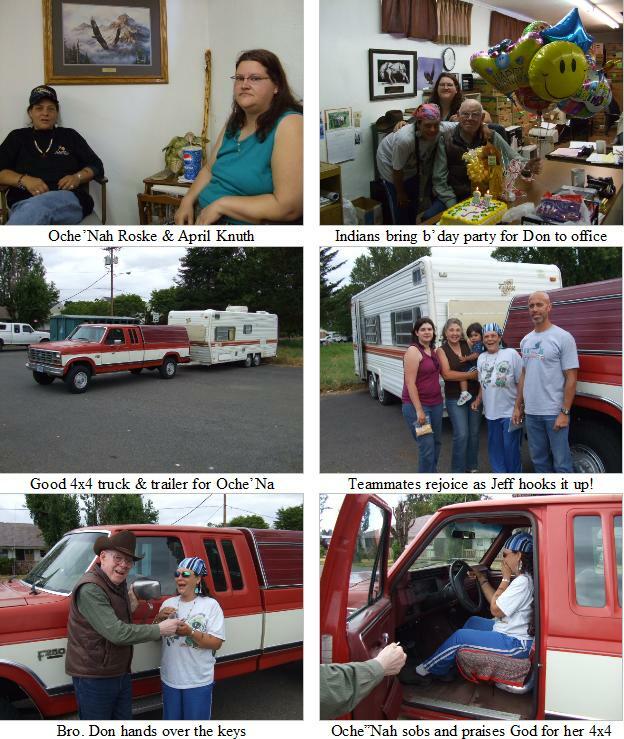 Since the founding of First Nation Ministries, about 3 years ago in January of 2007, we have made 66 trips with 94 visits, and 19 of these have been with the wonderful 1999 Western Star Big Rig and its 48 foot semi- trailer, which God has provided us. Neighbors, I’m not bragging or calling attention to this old 87 year old preacher, but want to share with you what God is doing and give Him all the glory. Likewise, I want to thank you, thank you, thank you, wonderful teammates! As I recently awakened in the middle of the night I was praising God and praying, and suddenly the word of an old gospel song flowed through my mind. To my surprise, all the words came into my thinking and I do not even remember having memorized it or used it. It was copyrighted years ago by Mike Payne and Ronny Hanson and is entitled “When He Was on the Cross, I Was on His Mind”. For when He was on the cross I was on His mind. Neighbor, this is wonderful truth and is for each of you as well as “old brother Don”. He knew back there about His plan, purpose, call, and blessing on each one of us. I’m called to reach Indians for Christ. I can’t quit as long as God gives the strength, opens the doors, and supplies the needs to do the job! I’m called; I can’t quit until He says to quit or calls me home. What a wonderful God we serve! I’m enjoying every day. Praise be to our God. Not just some empty talk. Is by the way you walk. Or wishes by the score. Is by the life we show. You cannot pray the Lord’s Prayer and even once say “My”. From the beginning to the end of it, it does not once say “Me”. A little white one that I take goes to my hands so they won’t shake. The capsules tell me not to wheeze, or cough or choke or even sneeze. The orange ones, very big and bright, prevent my leg cramps in the night. But what I’d really like to know…is what tells each one where to go! Many Columbia River Indians on the Oregon and Washington shores and foot hills listen to their old missionary Brother on the Voice of First Nation Ministries’ broadcast, daily at 6:15 PM on KPDQ FM. A number of these good people want to still be Indians and love the traditional manner of living off the land. The wonderful salmon the Creator has faithfully sent them is a great part of Indian life. The hills provide deer and elk as well as roots, berries, and other edible vegetation. Oche’Nah found Jesus as her Lord and Savior and feels this is her area of labor – winning Indians to Jesus! The band of believers are most grateful for our help and faithfully bring their offerings in month by month to our office. 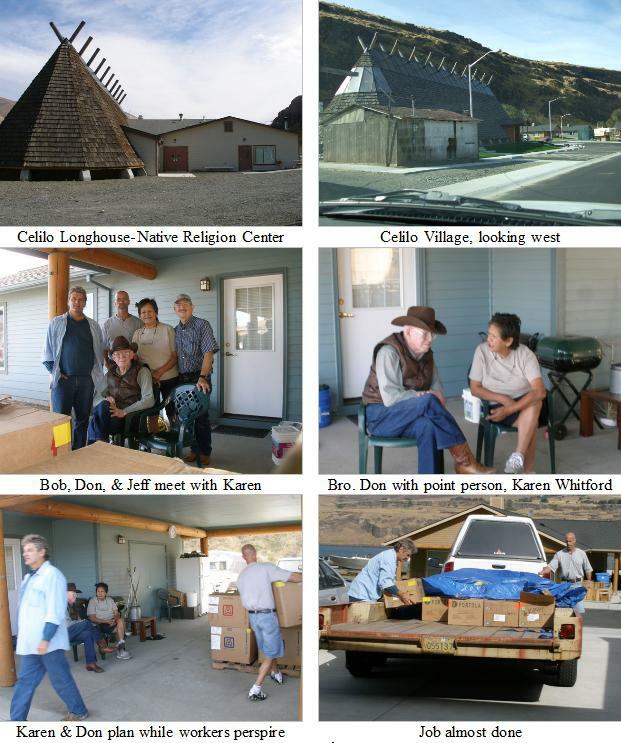 On Thursday, September 3rd, at 8:30 AM, Jeff Phipps, Bob King, and Jeff Byers joined old brother Don in the Dodge Diesel and, with the twenty foot flatbed car hauler loaded with groceries, headed for Celilo Indian Village. We left all the driving up to Jeff Phipps and praised God for his skill and experience that make him one of the best at driving, loading, and everything that goes with the responsibility of getting there safely. 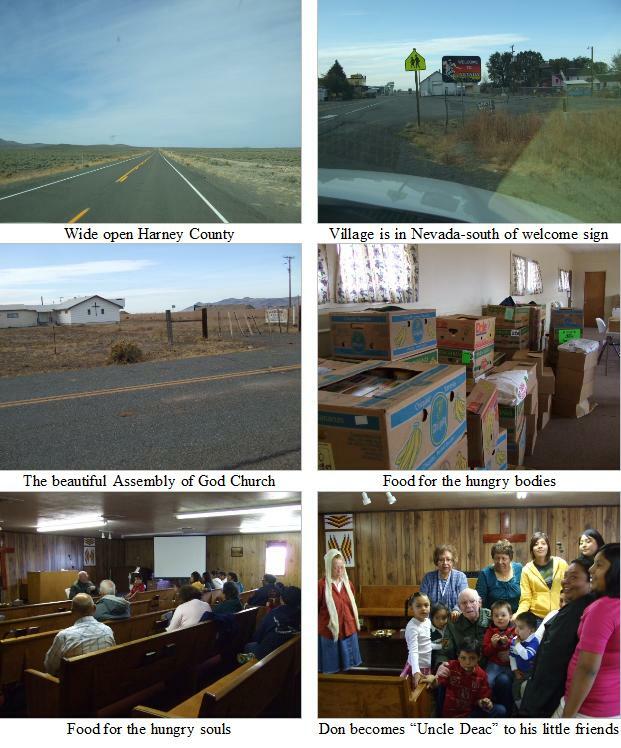 Our faithful point person, Karen Whitford gave us an excellent report; our food ministry is having a real effect in helping this small band find the Creator’s son, Jesus, as Savior. 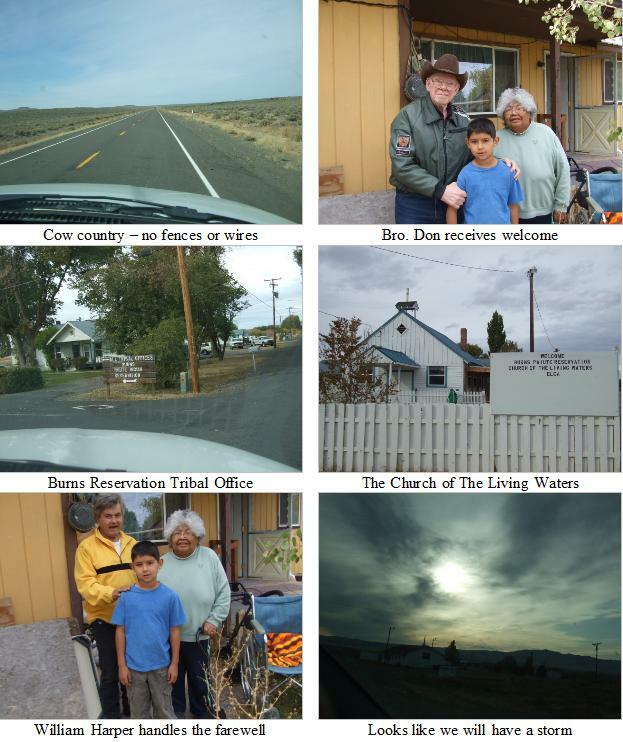 On a beautiful morning in October, Alaskan Athabascan, Willie Harper, joined his old brother Don, and with the big Dodge Diesel and the Wells Cargo trailer fully loaded, headed east to visit the Burns Paiute Reservation and then went south to the Fort McDermitt Reservation. Brother Leon Hansen and Brother Bob King have had a big part in developing this outreach, but circumstances beyond their control prevented them from making this trip. We thank Willie for doing a fine job of helping us out. What a blessing to help this dear Indian sister with her ministry at the Church of the Living Waters. Fort McDermitt Reservation lies in southern Harney County, Oregon and across the state line into Nevada. This is lonesome country which has been cow and sheep territory since the coming of the white man. We are told this is the largest county in all 50 states with a population of only about 7000 people, and is home to the Paiute Indian people. The Assembly of God has built and well equipped this very nice church, but there is a real problem getting missionary pastors. Let us join them in their prayers for God-called workers who will come to stay in spite of all the isolation and the distance of 70 miles to the nearest supermarket. This group of believers are counting on us!